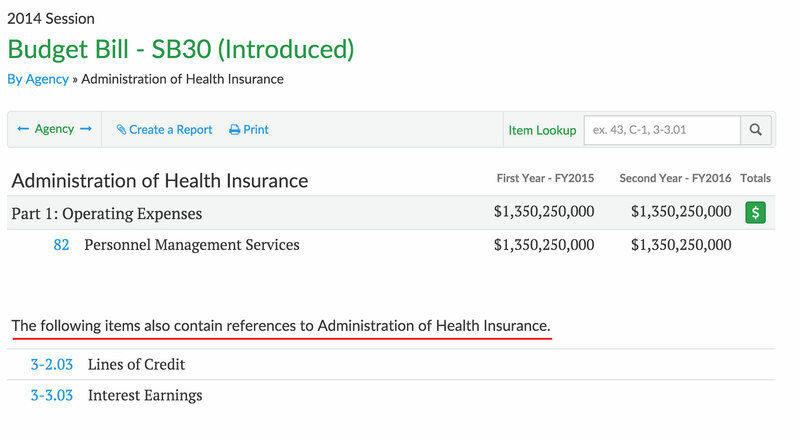 Budget bill items may have changes to dollars and/or language that are stricken/italicized to show the changes, but this is not always the easiest way to view the changes. Now, users may click a "Show Highlight" link to display stricken dollars/text in red text color, and italicized dollars/text in yellow background color. To turn off the highlighting, click the "Hide Highlight" link. All budget bills may pass through stages, such as Member Request and Floor Request, where they can be amended by members. Senators amend the Senate version of the budget bill, whereas Delegates amend the House version of the budget bill. Even-numbered sessions typically have two budget bills, such as HB30 and HB29, that members can amend. 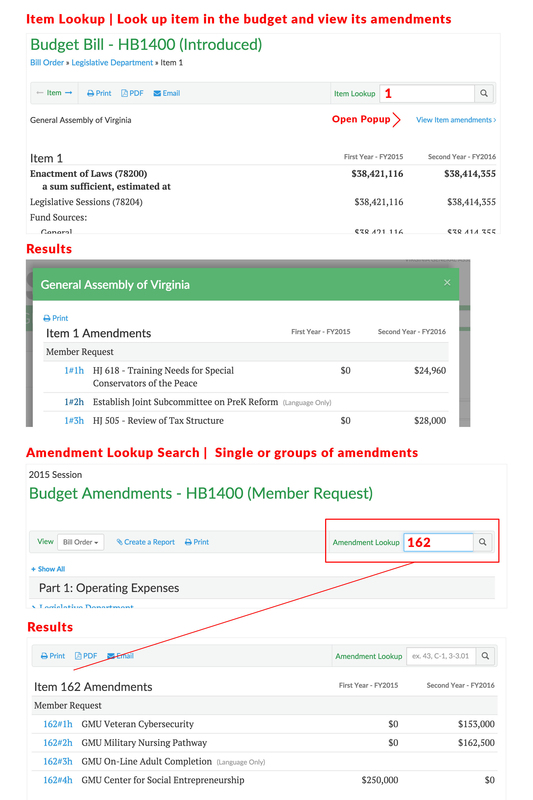 Click the "Member Amendments" link from any Budget Amendment "Table of Contents" page to see a list of all members for that session who have submitted budget amendments. Click the "Member Name" link to view all budget amendments submitted by that member for that session. 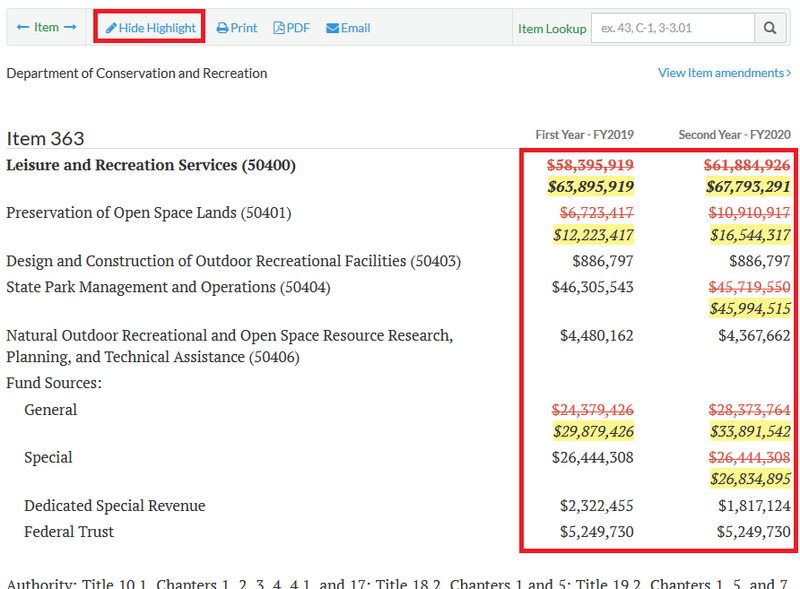 View Budget Item amendments for an item from an amendment page. 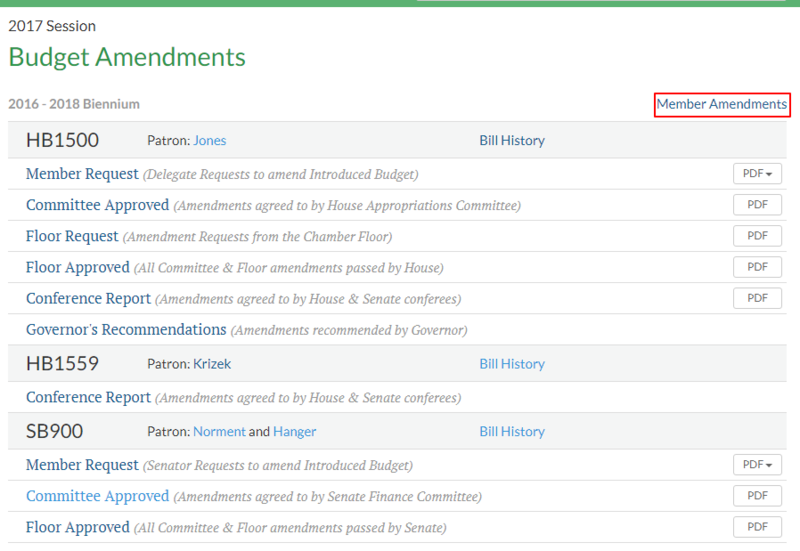 When viewing a budget amendment, the View Budget Item amendments link is shown. Click this link to view all amendments proposed for the item that the budget amendment affects. This view can be useful to track the history of an amendment through the legislative process. 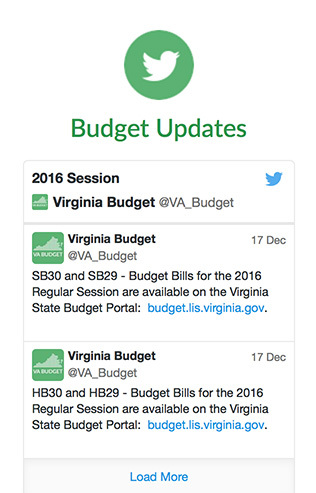 View all amendments to a budget item from an item page. When viewing a budget item that has amendments proposed to it, the View Item amendments link is shown. Click this link to view all amendments proposed for that item. Agency references. The agency view of the Budget Bill lists other budget items that reference the selected agency, even though they are outside the agency's budget bill section. Responsive design. The layout reflows on various screen sizes, to allow for ease of navigation on a variety of devices, such as a phone, tablet and desktop. Dynamic search results filtering. Use the links under Navigate on the left-hand sidebar of the search results page to narrow your search results. Use the Sort By: drop-down to change the order the of the results. Feedback button. The feedback button helps identify issues that need to be addressed and serves a communication link with our user community. Amendment / Item Lookup. Budget items and Budget Amendments can be directly accessed by entering the appropriate reference number in the lookup box.